I enjoy my Brit chicklit – and this was no exception. Eve is back at home living with her rather religiously fanatical parents. If you look at her lists: her life is pretty well on track: fiancé Adam, a new job in television and a therapist and friends who really seem to understand her. But why are things so unbalanced? Let’s start with Eve – she’s very young and her lists often serve to hold her back. And she’s got no filters – she thinks it, she says it more often than not. Excerpt to those she views as authority figures (boss, parents) which often leaves her in desperate need of that therapist, Gudren. Eve as a character was likable, even if a bit scattered but Adam was pompous and not particularly ooh worthy. And Eve’s attempts to wrangle a proposal from him to comply with the reality show she’s due to appear on – yeah… not so much. The highlights of the story for me were the scenes with Gudren (her therapist) and the outrageous and often hilarious dialogue that ensued. Overall, this is a light, candy-floss sort of book, enjoyable in the moment, much like watching a Benny Hill sketch. You laughed at the ridiculous parts and it was fun while it lasted, but there were few, if any, truly memorable moments or characters. In this book, Eve and her therapist are really the only two who make an impression: perhaps it has to do with narrative voice of Eve: she almost seems as if she is setting a stage play around her. A viral video of drunkenness and vomiting over a policeman is the stuff of nightmares, and so is living back home with your religious, nutty parents. 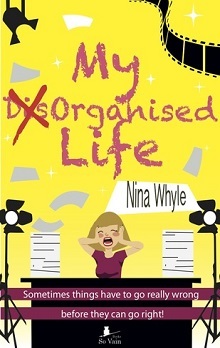 Fed up with life not going her way and turning quietly insane, Eve Poots comes up with a plan. Well more of a list of “things to do while she's still twenty-something”. Six months later, and the list is working its power: she is now living with her new boyfriend, junior doctor Adam, and working as an assistant to TV producer Alastair on a reality show – life really is on the up. Has her life suddenly turned into a TV melodrama of its own?